Two sides of A4 is quite enough, Sue insists, for this letter. And what she says three times is true, so it must be. Please take as read our standard apologies and excuses for not being in touch. We are thriving here in Bristol, still living with Steve Poulard, and none of us any the worse for the experience. And we don't know where the last few years have gone. The changeling. He cares about fashion and listens to music. This may be normal teenage behaviour, but he certainly didn't get it from his father or brothers. He is also part of 'Devotion', the church group for teenagers, and goes to Crusaders on a Thursday night. There seem to be girls in his life as well, but we're not supposed to know about them. Last year he took part in the Bristol- Bordeaux French exchange, and thrived on that despite misgivings about him being the youngest participant. We also enjoyed having Loïc stay with us, and meeting his twin brother Arnaud staying elsewhere in Bristol at the time. In February he tolerated a four day trip to France with his parents: Sue had set her heart on seeing the Millau Bridge, and after that he enjoyed go-carting and quad-biking, and getting the hire car stuck in the snow when we went to see the wolves! Ian also has clear political convictions and would dearly like to set the world to rights. When he is rich enough, he will do so. Social interaction IRL (in real life) is limited to Explorers, but his paper rounds have financed the purchase of his own computer which enables Weirdofreak to play a full and active part in various online communities. He's also been on two school ski trips which he has very much enjoyed. For several years, he has been mastering the complexities of the teenage grunt, but recently we have detected some English words escaping. The forecasts for his GCSEs in 2006 are good. Philip was on the school team which made the finals of the UK Mathematics Trust Team Challenge. Paul went up to London to support the team with Paul's parents, but were strictly not allowed to cheer them on. Suggesting to Alan that he should apply for a job we saw advertised at the local cinema was inspired. It is a small and friendly place where they really care whether you enjoyed the film or not. In slack moments he can read a book or do his homework, and there are two free cinema passes each week as a bonus! It's also warm and dry once he gets there, and as it's just under 30 minutes walk away we don't have to chauffeur him there and back. This has financed his ongoing driving lessons (all the best people fail x times), and regular after school trips to the local shopping centre with friends who make him look quite normal. However we suspect more people know him as Draknek, in which guise he moderates various websites. His grades at AS (Maths, Further Maths, Physics and Computing) were encouraging, and he's continuing those to A2 and added AS Critical Thinking to his timetable. Visits to assorted universities have led to Warwick and Southampton being his 1st and 2nd choice respectively to read some sort of computing. Paul is doing too much - everyone says so. He is also, according to Pam, our church leader, 'ubiquitous'. He doesn't think he has ever been accused of that before. Apart from running Crisis Centre Ministries, Paul is on the board of the Sea Mills & Coombe Dingle Community Project (the local community development project here in Sea Mills) and of Voscur (Bristol's Council for Voluntary Services), and he is on the steering groups of BCAN and the BCAN Homeless Forum, which has just formalised itself with a public launch in April after operating as an informal network for the past three years. All this activity led to an invitation to meet the Prime Minister: in February he attended an evening reception with Mr and Mrs Blair, to whom he did not actually manage to speak (more details...). This is probably just as well, since his clients had given him a number of messages to pass on - few of which were repeatable. Over the past six or eight months, Paul's skin has been causing problems again, after a period of maybe six years when it has been almost completely clear (more details...). The good news is that this led to a referral to a dermatology nurse who's made some helpful suggestions. And no, it's not stress - despite all the activity, Paul feels much less stressed now than when we were trying to move to Bristol, or when we were running the Snowball programme. Sue is still the Administrator at One25, a charity working to help vulnerable women in Bristol, and we have it in writing that Sue was 'awake, alert and oriented' at some point in the past year, which was good news. If you promise not to panic you may read on: Sue has a small, benign, slow growing brain tumour behind her left ear, a posterior fossa meningioma if you want the technicalities. They found it in a brain scan (which definitely proved she still has a brain - quite a colourful one at that) while they were looking for a reason for the dizzy spells of a year or two back, which they still can't explain. We were anticipating an operation in April, but for some reason her blood pressure was a little on the high side, so she's being treated for that and we're now hoping for a date in May (more details...). After that she will probably be off work for around six weeks. But that is okay, as One25 now have a wonderful Administrative Assistant to hold the fort in her absence. If you want to be kept in touch with Sue's progress Paul is likely to find that email is the easiest way to keep in touch, so if you want to hear from us that way, please email to say so! If you don't use email but want to be kept in touch let us know that as well and we'll see what we can do! We are still part of Highgrove Church, participating in a variety of ways. And we've made a couple of quick dashes back to Guildford to witness the baptisms of our godchildren Jenny, Katie and Chris: what a delight! Given that our boys are so radically different, it's a delight to discover things we can do as a family. The new Dr Who series sees us all jammed into the lounge - with Steve - and no-one has yet hidden behind the sofa... The Hitchhiker's Guide to the Galaxy is another favourite, and we'll no doubt all be off to see the new Star Wars film. Families are mostly well: we celebrated Sue's Dad's 80th birthday last September with all their children and grandchildren there. Quite a feat of organisation! And on our latest trip to Paul's parents we showed them what happens inside Laserquest, after which we (Paul, Sue, Mum and Dad) retired for coffee while Roger and the lads charged around zapping each other. We have been running a K-reg Saab for several years. Everyone said they were reliable, but this one was constantly needing to have bits replaced or otherwise sorted out. Then, early in 2004, it started stalling. One garage looked at it, with no joy. We took it to a specialist on the other side of Bristol, who fixed the problem for a week or two. They had no idea why the problem should come back. We didn't have the time or the energy to keep on paying people to fail to fix the problem, and it continued to get worse. Various other parts broke or wore out. Eventually, we had enough and started looking for a replacement. The main reason for getting the Saab was because we needed a large car to fit three teenage boys across the back seat. However, we do so few miles these days with all three boys that it really doesn't make sense to make this a high priority. We looked at a Corsa and decided it really was too small. Then we nearly went for a Vauxhall Aguila, but the dealer wanted a decision before we were ready to make one. After trailing round numerous dealers, we decided that a Totota Yaris provided a suitable balance - small and economical to run, but not too small to squeeze the boys in at a pinch, and not too small for the weekly shopping. We were about to buy a reasonable second-hand model, as we always do, when the salesman made us an offer we couldn't refuse. After thinking about it for a day, we didn't want to refuse it, and for the first time in our lives decided to buy a new car. When we looked at the figures in detail, it turns out that we are paying only a little more each year to buy the Toyota than we were spending on repairs to the Saab, we get about twice the mpg we managed before, and it costs a lot less to insure. Plus, driving around town and parking is so much nicer. Sue still misses the Saab, though. We aren't really cutting-edge technology people. Sue is addicted to little electronic things that make irritating noises when she needs to do something, but mostly we avoid technology until we can't avoid it. However, living in a house with a TV (owned by Steve!) and three boys, it was inevitable that we would accumulate thousands of Video tapes - some pre-recorded and some with recorded TV programmes. It was a nightmare: you never knew what was recorded on what tape, how long it was, or if some other vital programme has been recorded after the first item on the tape. Enter the DVD re-recorder. Sue bought it for Paul, as a joint birthday and Christmas present. It is absolutely brilliant. We wouldn't quite say it has revolutionised our lives, but it has made a small part of our lives so much easier. For a start, you can start to record a programme, and then a little later start to watch the programme you are recording from the start. So if we get in later than planned and there is something people want to see, we don't have to rush tea or have boys wanting to disappear halfway though because the programe is about to start - we simply record the programme and then start watching it when we are ready, maybe ten or fifteen minutes later. Plus, you can fast-forward through the adverts, and it has a really nifty trick - you can choose to watch at 1.3 times the normal speed. There are several other neat features. Space on the DVD is managed like files on a computer's hard disk, not like recordings on a video tape, so you don't have to worry about recording over something you want to keep - recordings are kept until you choose to delete them. All the free space on the DVD is available for recording (you don't end up with several spaces in between programmes you want to keep). There is a menu showing you all programmes you have recorded on the DVD with a date, channel and perhaps the name, so you can tell at a glance what is on any DVD. And when you put a DVD in the machine, it tells you how much free space is available. It's simply brilliant. Paul was invited to a reception with the Prime Minister at Lancaster House on 21 February 2005. The invitation said the reason was "for services to the voluntary sector", but we are not entirely clear why Paul was chosen. Crisis Centre Ministries is known to various parts of the Home Office and the ODPM; or perhaps it was through Paul's chairmanship of Voscur (Bristol's Coucil for Voluntary Services) - or perhaps for something completely different. 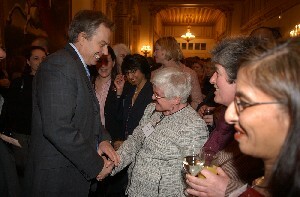 The picture shows Mr Blair at the reception. He gave a good speech, saying all the things you would expect, but only spent a short while meeting people before dashing off to get to another high-powered meeting. Perhaps it was a good thing: if Paul had passed on all the messages people had given him for the PM, he may well have been locked up; and Sue reckons that a picture of Paul shaking hands with the man who took us into the war could be grounds for divorce. If you look at the picture, Paul was standing just in front of the pillar you see behind Mr Blair's head. There were about 400 pictures taken that evening - we haven't checked all of them to see if Paul can be seen in the background. We are delighted to report that Alan passed his driving test on 17 May 2005 - third time lucky. Thanks to all those who were praying for him. You can read the latest on Sue's Health Page. One possible reason why the skin has been playing up is because Paul has a 'hormonal imbalance' which causes him to start sweating without any good reason. This really irritates the skin. The doctors can't find any good reason for this, and there is supposed to be a referral to an endocrinologist, but no news of any appointment as yet.